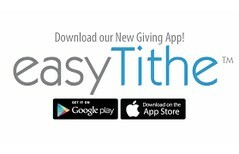 Use your computer, smartphone or tablet to give via debit, credit card or bank account through our church's secure easyTithe website! Just click HERE to create an account or login to an existing one. Once you have logged in, you will be able to make a one-time gift, set up recurring gifts, and view giving history. Click HERE for a quick tutorial on easyTithe. We are never more like Jesus than when we are giving! Join with the vision of Marietta First Baptist Church to make an impact on our community and world! Psalm 25:4-5 says, "Make your ways known to me, Lord; teach me your paths. Guide me in your truth and teach me, for you are the God of my salvation; I wait for you all day long." As the Lord guides us in His truth, let us be obedient to His Word with our finances so that this church will keep moving forward for God!